Introducing the Smok X Cube II 160W Box Mod by Smoktech, is the latest and most advanced variable wattage device that comes with temperature control feature. The great feature about the Smok X Cube 2 is the Bluetooth 4.0 technology (compatible with ISO 7.0+ and Android 4.3+ system). This feature allows you to track the location of the device and activate the temperature control function (can be purchased through app for $2.99). The ranges for the temperature control settings are between 100℃ to 315℃ and 200˚F to 600˚F. With its ability to fire up to 160W of power, it will enhance your vaping experience. The lowest wattage that can go is 6W. Variable voltage option is also available as well with the range between 0.35V and 8V. 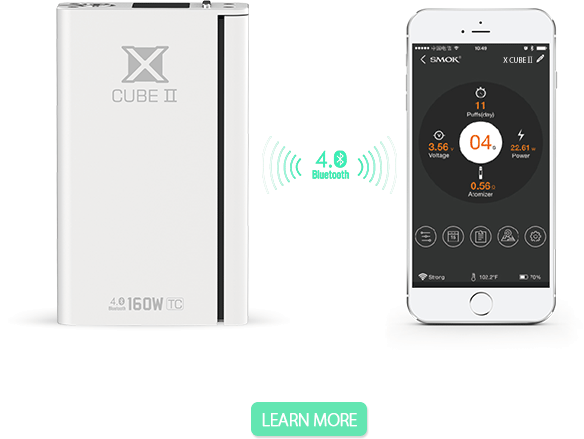 There are three output modes available for the X Cube 2: Temp mode, Watt mode and memory mode. With its ability to fire up to 160W of power, it will enhance your vaping experience. The lowest wattage that can go is 6W. Variable voltage option is also available as well with the range between 0.35V and 8V. With the wattage setting, the lowest atomizer resistance that it can handle is 0.1ohm. 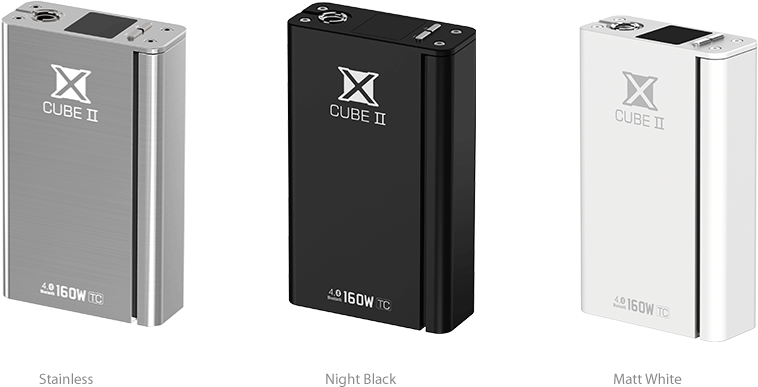 On the other hand, when it is on temperature control mod, the X Cube 2 can handle resistance as low as 0.06ohm. The OLED screen is beautiful with its ability to illuminate up to 16 million colors; this device sure will get everyone’s attention. Smoke X Cube II is powered by 2 18650 batteries. To make it easier when it comes to replace the batteries, it can be easily slide off and the door is held secured with magnets. For safety and reliable performance, protections come with the device including 12 seconds shut-off, short circuit/low resistance protection, overheat protection and low battery warning.